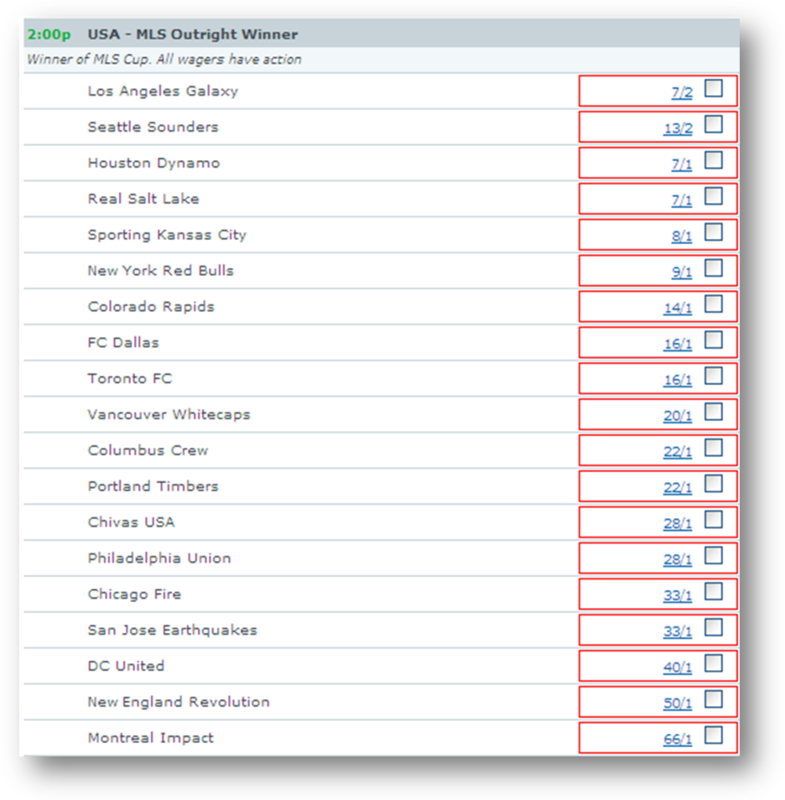 Bovada is our #1 rated sportsbook for betting on MLS Soccer. Check them out. You won’t be disappointed. There are several different ways to bet on soccer. The most common is to bet on the outcome of a single soccer match. Other wagers include future and proposition bets. Here we outline and provide examples for all the different types of bets that you can make on the game of soccer. For a single match, a bet can be placed on a point spread, the moneyline or the total. A point spread is number of goals that an odds maker thinks that the better team will usually win by. For example if the LA Galaxy were playin g the NY Red Bulls this Saturday, and the odds maker thought that on average the Galaxy would beat the Red Bulls by 2 goals, he would make the point spread 2 in favor of the Galaxy. This point spread would look like this. The above point spread (also called “the line”) means that if you want to bet on the Galaxy with the spread, you would have to give 2 goals. This means that LA would need to win by 3 goals for you to win your bet. If the Galaxy wins by 2 goals, the bet is a push and you get your money back, and if they win by 1 goal, draw or lose, you lose your bet. Now if you bet the Red Bulls +2, you are getting 2 goals. So if the Red Bulls win the game, draw or lose by 1 goal, you win. If they lose by 3 goals, you lose the bet. If they lose by exactly 2 goals the bet is a push, and you get your money back. The point spread can be any number that a sportsbook thinks will attract an even number of bets on each side. The line can be a whole number like 1 or 2 of a half a number like ½ or 1 ½. You will have to pay a price (or odds) to bet on the spread. In the example above the price is -110. This means that you would have to bet $110 to win $100, but you don’t have to bet $110. You can bet any amount you want. Many online sportsbooks allow you to bet as little as $1. We used $110 in this example, because it makes these odds easier to understand. A second example pits D.C United against Seattle Sounders FC. In the above example the Sounders are at home and favored by ½ a goal. This means that if the Seattle wins by 1 or more goals, a bet on Seattle would win and a bet on DC would lose. If the Sounders draw or lose, a bet on United wins and Seattle backers loses. The odds on this match are also different. In this example, you would have to bet $115 to win $100 on the United, but only $105 to win $100 on Seattle. A bet on the moneyline is a bet on a specific outcome of a game. In soccer that bet can be the winner of the match or a draw. Let’s look at an example below. In this example Chivas USA is favored over Houston. Notice that in this example the odds are positive. This is the amount that you can win by betting $100. So if you bet $100 on Chivas and they won, you would win $135. If you bet $175 on the Dynamo and they won, you would win $175. Lastly if you bet $100 on a draw, and that’s what happened, you would win $225. Again you can bet any amount you want. We use amounts of $100 in our examples because it keeps the math easy. Let’s look at another match. In this example the Earthquakes are large favorites over the Revolution. You would need to bet $110 on San Jose to win in order to win $100. But if you bet $100 on New England to win and they won, you would win $290. A $100 wager on the draw would pay $235. The total is a bet on the number of goals scored in a game. In this example the total is set at 2½. If the Rapids and Crew combine to score 3 or more goals the over wins. If they score 2 or less goals, the under wins. Notice that over/under bets have odds too. In this example the under is favored. You can win $120 if you bet $100 on the over. You will need to bet $150 to win $100 on the under. Again you don’t have to bet $100. You can bet any amount you want. Here the over/under is 3. If the Timbers and Impact combine to score 4 or more goals, the over wins. If they scored 2 or less goals, the under wins. If they score exactly 3 goals, the bet is a push and your money is refunded. Future bets are wagers where the outcome of a certain event depends on more than one game. For example, you can bet on the winner the MLS Cup before the MLS regular season even starts, and you can bet on the winner of the next FIFA World Cup years before the actual event. We include a few future bets as examples below. Prop bets can be on anything, and they always have odds. For the NFL Super Bowl every year, one of the oddest prop bets is how long the national anthem will take. Every year a lot of people make this bet, and use stop watches to time the singing of the national anthem to see if they won. This is a complete list of all bets that you can place on soccer. If you have any other questions on how to bet on soccer please let us know in the comments, and we’ll be sure to address them.